I've praised Chris Hogan's Small But Vicious Dog before. 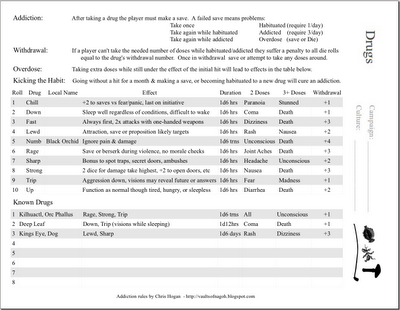 One thing about the drug rules therein is that I doubt my players would every risk taking them. I know that not all drugs offer mechanical benefits and that those drugs as Chris has them are probably well suited to the darkness of Warhammer Fantasy, but I wanted drugs that would tempt players. 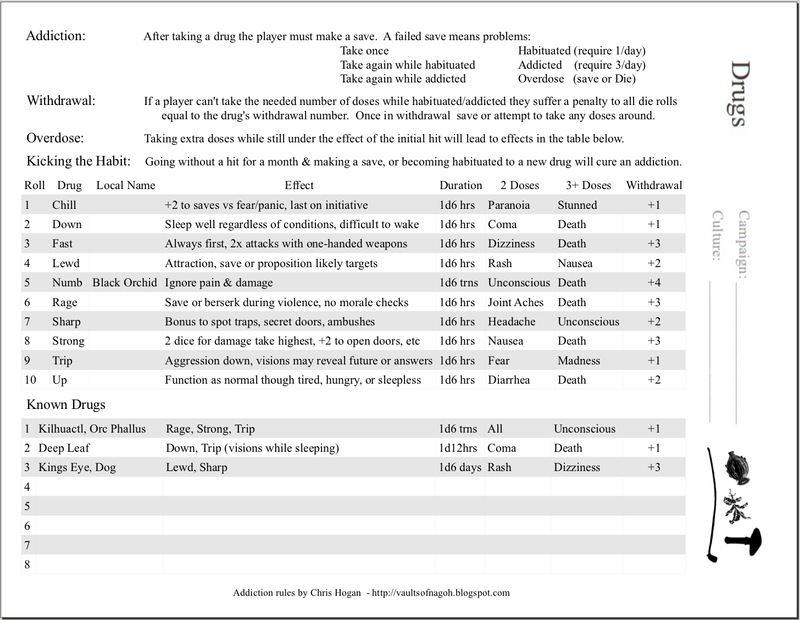 Here is a single page that combines Chris' rules on addiction with 10 basic drug types. You can name these types for your campaign or you can mix and match them for more complex drugs below. 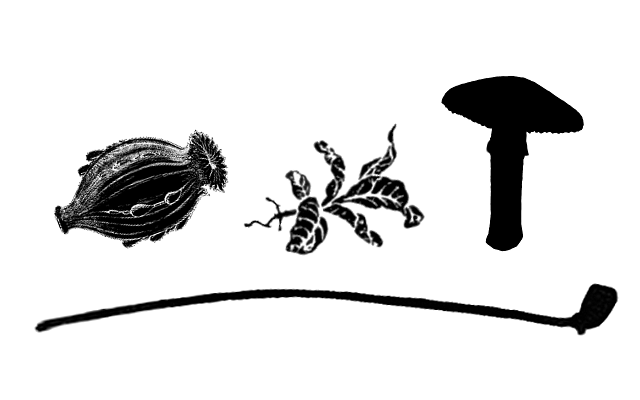 I made a few as examples. The only thing I wish I could have but don't know how to fit, is how the drug is taken: smoked, drunk, sniffed, etc. The complex drugs below have more room, so you could enter a note there. Here is the Write file so that you can mold it into something that works for you. Note, more undefined side-effects. Disease will have some too. Maybe a one-page side-effects is the answer. I really like these one-page charts you're making. They're ideal for quick use in play, definitely something I'm gonna copy for use in my ringbinder next campaign I run. If I'm reading the rules right, a functioning user would be in withdrawal nearly all the time. Is that right? Either you're not taking enough doses and so suffering the dice penalty, or else you're very quickly going to fail your saves and die. At first that struck me as a flaw, but on second thought it's actually quite elegant. Yeah, they are pretty brutal, if you fail a save three times you could overdose on the third day. Fail a save then and it's curtains. I'll have to try it in play to see if it's too brutal. Maybe the enticements might need to be stronger. I was thinking of giving MUs bonuses to spell research if they use a Trip drug. Thanx for this, I'll be using it in my campaign! Great! and thanks. I'm back to work now, but I've got Diseases and Poisons bubbling on the back burner. Maybe Addiction could be "roll two saves, if BOTH fail, addiction?" That's a lot more tempting, but it'll still get failed eventually. Thanks, Eric. I like the drama of one roll, but it could add some flavor if you rolled a stat check against wisdom and constitution. If you try it let us know how it works.